Los Angeles-based flutist, Rachel Mellis, holds a versatile career as an orchestral musician, chamber musician, soloist, and recording artist. She has performed with the American Youth Symphony, YMF Debut Orchestra, Orange County Choral Society, was Principal Flute at the Marrowstone Music Festival, and has been a featured soloist with the Bellflower Community Concert Association. Rachel has played under the baton of Carl St. Clair, Michael Tilson Thomas, Joey Newman, David Newman, Lucas Richman, Richard Kaufman, Jung-Ho Pak, Frank Ticheli, James Conlon, and John Williams. Rachel’s commercial projects have ranged from recording for dubstep artist 12th Planet to performing at the House of Blues Sunset with Nickelodeon star, Drake Bell. Her television appearances include a musical segment on the educational TV show Brainstorm, and a feature on Chinese national TV with the Debut Orchestra, as part of a live New Year’s concert broadcast from Chengdu. Her playing can be heard on many award winning film soundtracks, TV shows, commercials, and CDs. She has been featured on soundtracks alongside the Babelsberg Film Orchestra, the London Metropolitan Orchestra, and the Chinese National Symphony, and has recorded in the Village Recorder, Capitol Records, and Warner Bros. Studios, among others. Rachel has premiered the works of many film and concert composers, and recently performed in the concert premiere of the music from the film War Horse, conducted by composer John Williams. Besides the standard concert flutes, her recordings and performances often feature an array of world flutes, such as the Dizi, Shakuhachi, Penny Whistle, Native American flute, Fife, and Recorder. 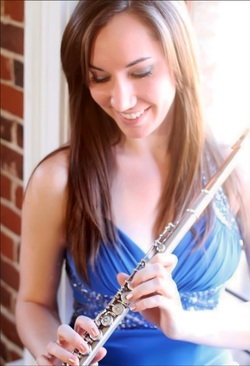 Rachel earned her Bachelor and Masters Degrees in Flute Performance from the University of Southern California, where she studied under Jim Walker and Gary Woodward. Other mentors have included Brian Gordon, Heather Clark, Catherine Karoly, Jill Felber, Carol Wincenc, Trevor Wye, Walfrid Kujala, Amy Porter, Louise DiTullio, Elizabeth Buck, Thomas Robertello, and Bob Sheppard, as well as Rachel’s mother and first flute teacher, Carol Mellis. In her time at USC she was also accepted into the USC Mentorship program, in which she had a personal mentorship with Michael Gorfaine of The Gorfaine/Schwartz Agency. Rachel is currently Assistant Director and a performer with Classical Revolution LA (CRLA), an organization that brings classical music to venues outside of the concert hall. Classical Revolution began in San Francisco in 2006 and since then has grown to over 30 chapters around the world. CRLA recently launched the LA Indie Series, a series dedicated to performing the works of current Los Angeles-based composers.